The Client (also referred to as John Grisham's The Client) is an American drama series that aired on CBS from September 17, 1995 until April 16, 1996. It aired for one season, premiering with a two-hour movie pilot on September 17, 1995, and airing new episodes through April 16, 1996. 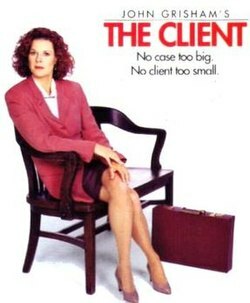 The series was based on the 1994 eponymous film The Client, itself adapted from the 1993 John Grisham eponymous novel. It starred JoBeth Williams, John Heard, and Polly Holliday in the roles created in the film by Susan Sarandon, Tommy Lee Jones, and Micole Mercurio, respectively. The leads of the series were played by JoBeth Williams as Reggie Love, and John Heard as Roy Foltrigg. As series regulars, Polly Holliday as Big Momma and David Barry Gray as Clint McGuire are the only other characters to appear in all 20 episodes. Besides Micole Mercurio, who played Big Momma in the film and guest-starred in the fourteenth episode, Winning, as Naomi, the only other actor to appear in both the series and film was Ossie Davis. His portrayal of Judge Harry Roosevelt in the film, led him to recreate that part in 13 of the 20 first-season episodes of the series. While the series lasted 20 episodes, it reached a larger audience when the TNT Network rebroadcast the series five nights a week, March 1999 through February 2001, to solid ratings. While the full series is not yet available on DVD or Blu-ray, the 1995 pilot episode of the series was included as a bonus feature on the 2013 Blu-ray release of the 1994 film. ^ Bruce Fretts (June 9, 1995). "CBS Fall Television Preview". Entertainment Weekly. Retrieved 2016-05-11. ^ Todd Everett (September 15, 1995). "Review: 'John Grisham's the Client'". Variety. Retrieved 2016-05-11. ^ "'Client'-Ele". Variety. March 12, 1995. Retrieved 2016-05-11. ^ "JoBeth Williams' 'THE CLIENT' begins encore run on TNT". The Houston Chronicle. March 14, 1999. Archived from the original on 2012-07-09. ^ "The Client (Blu-ray)". WalMart.